The Image that Failed to Shock? 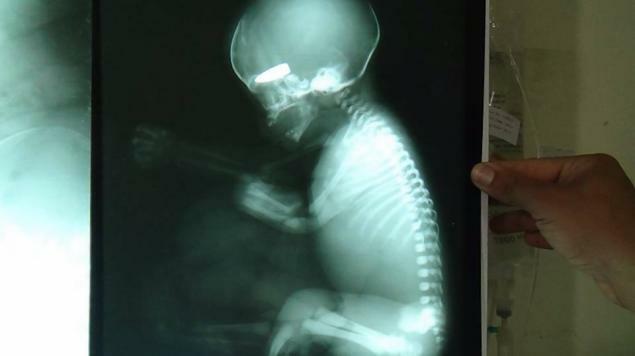 An x-ray image which appears to show a foetus with a bullet lodged in its head was released to news media via the aid agency Syria Relief in an attempt to raise awareness of the current plight of civilians caught up in Syria’s civil war. More specifically, the image has been circulated amid concerns that snipers in Syria are not only targeting civilians, but are targeting individual body parts as if playing a game. The above YouTube video of the ITN broadcast of the Syrian x-ray image presents similar kinds of fissure. As with all such video clips, it jostles with millions of other online materials seemingly creating a ‘mad’ culture, with the footage itself working its way through the network of viewers in quite unpredictable ways. One particular irony of the clip comes from the fact that YouTube creates a front-image prior to anyone viewing the clip. Unsurprisingly the image selected in this case is the x-ray image itself. Yet, apparently, this image is so potent that it comes with a warning. Following ITN’s ident, but before the film piece plays, we receive the following message: ‘Some viewers may find the following image distressing to look at‘. How are we to feel looking at the image now, having already seen the image before pressing play? The cat is out of the bag. The danger has passed. Images are more real than anyone could have supposed. And just because they are an unlimited resource, one that cannot be exhausted by consumerist waste, there is all the more reason to apply the conservationist remedy. If there can be a better way for the real world to include the one of images, it will require an ecology not only of real things but of images as well’ (Sontag, On Photography). Sontag’s remark reflects upon the relationship between images and reality, which to this day is still frequently characterized in the terms of the Greek philosopher Plato, who advocated we ‘loosen our dependence on images by evoking the standard of an image-free way of apprehending the real’ (Sontag, 1979, p.153). The argument associated with Plato is that images are illusions; furthermore that the world revealed to us through our senses is only a poor copy of its true ‘Forms’, which can only be apprehended intellectually. We can consider Sontag was interested, though ambivalent, about the way photography can overturn the Platonic philosophy of images and reality. ‘Cameras’, she writes, ‘are the antidote and the disease, a means of appropriating reality and a means of making it obsolete’ (Sontag, 1979, p.179). Crucially, then, a so-called ‘ecology of images’ is meant to urge us to take images seriously as part of reality. ‘The powers of photography have in effect de-Platonized our understanding of reality, making it less and less plausible to reflect upon our experience according to the distinction between images and things, between copies and originals. It suited Plato’s derogatory attitude towards images to liken them to shadows [. . . but] the force of photographic images comes from their being material realities in their own right, richly informative deposits left in the wake of whatever emitted them, potent means for turning the tables on reality – for turning it into a shadow. Images are more real than anyone could have supposed’ (Sontag, On Photography). However, when returning to the subject of photography some thirty years later, in her book Regarding the Pain of Others (2003), Sontag is highly sceptical of her own idea. Commenting on the ubiquity of war imagery, she declares: ‘There isn’t going to be an ecology of images. No Committee of Guardians is going to ration horror, to keep fresh its ability to shock. And the horrors themselves are not going to abate’ (2003, p.108). Arguably, we might suggest Dr Nott and Syria Relief – in publishing the x-ray image – have indeed sought to take up their places among a committee of guardians. Yet, of course, the trouble with Sontag’s ‘Committee of Guardians’ is that, firstly, it suggests those ordained to undertaken this task are some kind of elite group; and, secondly, provides no clear sense of how and on what basis the ‘rationing’ of images would take place. Hence, perhaps, Dr Nott’s disappointment in finding the image fails to achieve what he had hoped. Back in the 1970s, Berger looked towards what he called a ‘new language of images’, by which he meant new means of reproduction being used for progressive purposes, for new audiences. It is perhaps only more recently, with the arrival of a digital culture, that we’ve begun to genuinely approach this ‘new language’. For Berger, there were two key ideas at stake. Firstly, a new language of images would enable new, richer forms of expression. And secondly, there lay in this new language, or visual literacy, the potential for a democratisation of meaning-making. Berger’s work continues to remind us of the need, or at least a desire, to take images seriously, particularly the potential to use images and their effects for critical and creative purposes. Yet, still, we cannot ignore Dr Nott’s situation: the failure of the image to complete its work. Dr Nott thought very carefully about the image. He possesses the deeper understanding of its provenance, which makes him well placed to provide its fuller context. Perhaps the mistake was to think the x-ray image was the image. In fact it was never anything so static, but instead came through a far richer ecology, of which Dr Nott himself was a part. We could say the image of the bullet to the baby’s brain never in itself fails to shock. It is shocking. Yet, what has failed in this case is its imaging (and our imaginations). It’s the failure of a far bigger picture.